Corey Dixon photos from Nebraska's 1993 media guide. History is engorged with fatal lapses: Lapses of judgement, of character, of vision, of clarity of foresight; of action, inaction, even overreaction. 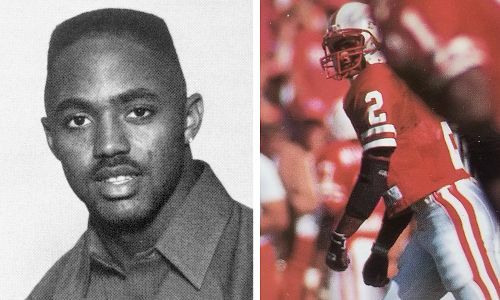 Any reasonable and objective individual viewing Corey Dixon -the speedy Texan wearing jersey number 2- sweeping, skirting, sprinting, sliding by and slipping into the Orange Bowl’s end zone on his 71 yard punt return for a Husker touchdown, knows whereof I speak. Question: Hey, Corey, I hear you have two daughters who are pretty good soccer players? Q: So you had your first daughter two years out of school? CD: Actually, when I finished up in ’94. She was born in ’94. She was born in Atlanta when I was with the Falcons. I went as a free agent. CD: It was a beautiful experience. I loved the situation we were in as far as the Run & Shoot, especially with me being a small and speedy guy as a receiver. You’d get some situations where we’d need four or five receivers out there at the same time, so that was something you looked forward to. 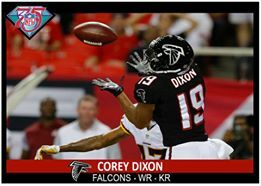 I was in Atlanta two years and I played in the CFL for a little while and then I played with Barcelona of the World League. After that I kind of fell out of love for it. My mom was diagnosed with cancer, and then you go through politics of the NFL and you learn it is not just about the game anymore: it’s a business, the adaptation to that with agents and money and endorsements. It was like, ‘Wow, it’s not fun anymore.’ (laughs) The money was good, the limelight was nice, and if I were to do that over again I wouldn’t pass it up for the world. Q: How did you end up in Dallas? CD: I was born in Dallas. Born and raised right out of Dallas, Texas. Q: So it was only natural you went back home? Q: What are you doing as a vocation? CD: I still have a production company. We produce a lot of records, put on shows. Like now I’m doing some work for the Steve Harvey Morning Show and I have graphic design company, as well. I have a production company and a graphic design company, and during tax season I have a tax company that we run here in Dallas, as well. CD: Yeah, you know, you’ve got to keep busy. It’s kind of like football, you get paid for sixteen weeks and then the offseason happens and you have to find your niche to take up the free time. Q: Well, let me ask you, how did you end up at Nebraska? CD: Growing up I was always a running back, one of the top running backs to come out of Texas. And I remember Nebraska being the powerhouse it was when I was growing up. I wore red and white growing up and there was always the Nebraska-Oklahoma rivalry. And my freshman year of high school I told my coach, “If I can’t get to Nebraska from here, I need to go somewhere else,” and coach told me it would be up to me. I tell you, Coach Osborne and Ron Brown and Jack Pierce recruited me pretty heavily and it actually came true. Q: What did your family and friends think about your Nebraska fascination? CD: First, with me growing up and talking about it, it was, “Yeah, right.” I think a lot of people I knew growing up knew that I would go somewhere, but not go that far from home to play ball. So when I made the commitment at that time -my mom wanted me to go to Texas because it wasn’t too far, and my father wanted me to go to Oklahoma State- but they wouldn’t tell me until after I made that commitment. 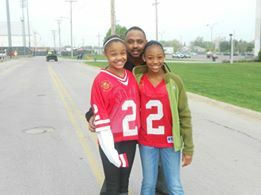 But Nebraska was my dream, and once I made that move we created a lot of fans right here in my family. 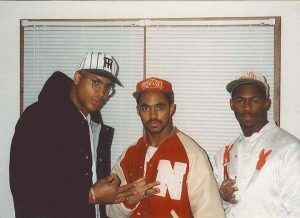 Right up to this day they’re die-hard Nebraska fans. Q: Did you have any favorite players? CD: Watching TV, I used to love to watch the way Steve Taylor walked from the huddle. When they’d break from the huddle Steve Taylor would take his time to walk to the line of scrimmage to call a play. And I liked Turner Gill, who was from Fort Worth. And Irving Fryar and Roger Craig were the guys I watched; I used to always do the high knee action from watching (Craig). Q: Your first year on campus? CD: My first year was 1990. That was my class. My first day on campus, my parents drove me up. Two-a-days was up, and me being away from home for the first time? I tell you what, it was probably one of the hardest days in my life, seeing my family leave me 11 hours away from home and not able to look back and see my mom and them leave. I was trying to hold the tears in. I think I had to go off somewhere and just let it all go. Q: I’m sure they were doing the same in the car, huh? CD: All except for my sister. I think she was smiling. (laughs) She had the house to herself now. Q: Do you remember any first impressions of the program? CD: You know, I think when I came to Lincoln it was kind of like you or me growing up here where the Cowboys are America’s Team. When you were in Lincoln and you were a football player you were a celebrity. When I’d walk around it was ‘autograph time’, learning how to be in front of the cameras. It was like you always wanted to carry a nice demeanor/leadership-mentality about it, because you never knew who was watching you. Q: Do you recall the first friends you made on the team? CD: My first buddy -we’re still close to this day- was Sedric Collins. Jack Pierce, he recruited us both, and Sedric -being from Slidell, Louisiana- me and him would talk in the summertime before we even got up to campus. When we got up to campus we pretty much knew each other and that made the transition that much smoother. Sedric was my roommate, too. Q: Anything peculiar or different about the Nebraska people in general, compared to Texas? CD: I think -city-wise?- Lincoln at the time was more of a college town, and the people kind of looked at you and recognized you, everybody treated me nicely and respected me and looked after me. It made me grow up and get used to living in the limelight a little bit. Q: Were you expecting to be at running back right away or go straight to the receiving corps? 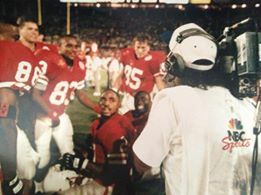 So my first scrimmage in the stadium -I think we had Pat Tyrance and Mike Petko at linebackers, and Reggie Cooper was sitting back there at the safety spot- well, Leodis Flowers was in the running back spot and I was the next running back to go in. But then Leodis took a handoff and Pat Tyrance hit him so hard! The hardest hit I’d ever seen in college football. Q: Did you work with Coach Solich then, as a running back? CD: I worked with him at the beginning, but I made the transition over to wingback and I got to work with Ron Brown ASAP. I was with Nate Turner and Tyrone Hughes real quick. Q: What about Coach Brown? What made him special? CD: Coach Brown? He believed in you, he was honest with you, and he’d make you become a workaholic. He was the type of guy that’s gonna make you be at practice thirty minutes before practice and then work forty-five minutes after practice, catching 100 balls after practice. I do that every day when I’m coaching. I tell the young guys today, ‘At least catch a hundred balls a day if you want to have good hands.’ Coach Brown was a workaholic, and whatever your craft was -I don’t care what it was, whether it was blocking, catching, running routes, learning the audibles, learning to read defenses- that’s what he programmed you to do. He made it seem like school in meetings and you’d get graded after every game. You had to make good grades in order to play, and I’m talking about grades on the football field. Q: How did you usually grade out? Q: Would the benefit be that you always knew whether you were improving/declining? CD: You’d know if you were improving because you started to limit your mistakes and you began to know everything that you was supposed to do. If you made bad grades you knew something was wrong. And I was the type of one that didn’t want to sit down, I wanted to be on the field. Q: Nothing worse than standing on the sidelines, eh? Q: Did you notice a positive aspect to the coaching? Rather than negative? CD: I’d never seen any negativity from our staff. The program was an A-type program. I’m talking about Tom all the way down to every assistant coach to the players. There was nothing negative. I’d hear things from other schools and I wondered how that could be, because I’d never witnessed anything negative in our program. CD: Tom Osborne: the way he was, his demeanor and his character. I always said that places have pretty much the mentality that the coach has. He had a lot of patience, which helped you become humble and patient. Coach Steele was a hardnosed guy that believed in you and wanted you to get after it. He made you aggressive offensively. We had a lot of coaches -even Turner Gill when he got there and started coaching- I liked what he had to offer to us. All the coaches had a lot to share, especially if you were a good player. You just had a lot of respect for all the coaches who knew who you were and believed in what you could to. That helped with the positive turn right there. Q: Any special occasions with Coach Osborne stand out to you? CD: You know, we were playing Oklahoma in Norman and I was getting ready to run a play, and the defensive back -I’m coming off of the line of scrimmage, I’m blocking him- and he says something about my Mom. He says, “Your mom looks like something or other,” you know? And the next play I went out there and didn’t even do what I was supposed to do and I went directly for that defensive back. I was throwing punches and everything. And a referee threw a flag and said if I didn’t calm down they were gonna throw me out. T.O. looked at me and said, “Is everything okay?” And I said I was fine. So after the game we were the last guys in the locker room and T.O. and me were the last guys in the showers. And Coach asked me what was wrong with me. And I told him that player said something about my momma and I had to get him. And he asked me if I did a good job of getting him, and I told him I felt pretty good about what I did. And he was like, “Okay, as long as it’s out of your system we can go on from there.” (laughs) I was like, ‘I’ll take that.’ I wasn’t in trouble after that. Q: Where were you the next New Year’s after you’d graduated, when the Huskers played Miami in Miami?